Just keep counting and arranging blocks according to the number you call out. 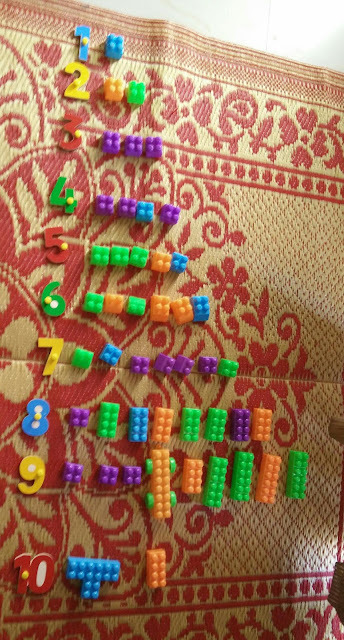 One of the activities to engage child while parent is attending to some task at hand. A was banging her hand on a plastic table when she questioned me: will the table break if I do this way? A: will it not break when I keep hitting? Me: if you hit it hard, it will break, not when you slightly do it. A: am I hitting hard on the table? Me: no, not really. You are light on it. The child doesn't know what is meant by hitting hard or light. Parent needs to explain what exactly is hard before yelling (but, do not yell) at the child for banging hard on something. So, next time, when your child is banging on something, show it to him what exactly happens when something is hit upon. How is the pressure carried forward. That is exactly how I have explained A whenever I had to convey her the consequences of something that may hurt her. When she is jumping around something sharp or hard that could hurt her, show her that edge which is sharp, rub your finger against it and with appropriate expressions tell her it would hurt if something sharp is rubbed against. When the child is hitting on a plank that most likely would break, show him how the plank would bend as you slightly press against it and tell that excess pressure would ultimately break it down. One may think that reacting in a rush in order to stop the child from what she is doing actually worked. It might have just worked at that moment but is not a beneficial solution in the long run. Blissful parenting may simply be defined as experiencing bliss in the parenting phase of life. Where is bliss? How many parents truly experience bliss while parenting their children? The child wakes up to start her day but does not move to freshen up - there are repeated calls from the parent to move out and the child still does not move. Bang! It has started. Yelling, child being more adamant to go against what is being asked, repeated yelling, threatening, child yelling, crying, again yelling at the child for crying instead of doing what is supposed to be done ending with heated up heads for all those involved. Where is the bliss? Child walks in to brush her teeth, but doesn't actually start brushing and then we witness ARC. Where is the bliss? It is mealtime, child has just had two spoonfuls and wants to get off the chair not really willing to sit for long to finish the meal. Then, there is ARC. Where is the bliss? The child is tired, upset with something, neither knowing the way to convey her feeling nor how to deal with it, turns violent, throws away stuff, kicks legs. Then, there is ARC. Where is the bliss? Child returns from school, might have had a bad day, or got affected by something/some words there, starts being weird at home. Then, there is ARC. Where is the bliss? Child is tired, unable to fall asleep just like we adults find it difficult to sleep when overwhelmed with physical/mental strain. The child, unable to share her feelings, starts acting hyper, that adds to her tiredness and cranky behaviour. Then, there is ARC. Where is the bliss? The child who is all set ready to go out, mind being preoccupied with some other activity, doesn't pay heed when called to put on her shoes. Then, there is ARC. Where is the bliss? Child opens up the rice can, starts taking out cup full of rice. The parent, not knowing what she would do with it and scared of the mess that would be created, reacts with a scream. Then, there is ARC. Where is the bliss? Child sees two bottles - one empty and the other half filled. She wants to pour water from the half filled one into the empty one. Parent, instead of understanding her purpose and guiding the same, reacts in a scream. Then, there is ARC. Where is the bliss? The child recalls an object that she played with, doesn't know what it is called, asks for it by not naming it. Parent, failing to understand her, instead of investing time to know more about what she actually wants, gets irritated and denies what is being asked. Then, there is ARC. Where is the bliss? The child, after returning from park, doesn't want to step inside the house, being already tired and recalling various past events, not knowing what she actually wants to do, drops to the ground and you see a tantrum coming. Then, there is ARC. Where is the bliss? Child is doing an imaginary play. She imagines there is a rabbit around her and plays/talks with it. You walk by her side and she feels that you actually walked over the rabbit. She says 'you stamped on the rabbit!!'. Depending on your response, she is either convinced that you didn't hurt it or upset that you didn't understand her right. Then, there is ARC. Where is the bliss? There is conflict of opinion between you and your child. Your child, being still in the developing stage, doesn't quite understand what you are trying to explain her. Then, there is ARC. Where is the bliss? Where is the bliss in parenting? Leave about the parenting phase, where is the bliss in one's life? Did you experience bliss in your childhood? teenage? adulthood? home? workplace? with your friends around? in your experiences with strangers? when you have a conflict of opinion with your partner? The ones who actually experience bliss in all that they do and experience in life know the true art of living. Since this page is more about parenting, let me narrow down this post to parenting phase of one's life. Where is the bliss in parenting? Bliss is within us. Bliss is within each of us, within every individual. Bliss is deep within the parent as well as the child who are actually facing power struggles at the moment. Bliss is within the soul of every child. Children are filled with bliss. Adults are filled with bliss. Parents are filled with bliss. Every individual is filled with bliss. Then, why don't we experience it? Because, the inherent bliss is being camouflaged by our momentary sensory reactions. We go by what we see, what we hear and tend to react with words rather than responding with heart. Understand it this way, all that we see is a layer of happenings occurring at the physical level. The event that is seen is not the event alone. It is the outcome of a combination of the mindset of the doer at that moment(A), past experiences and understandings impressed upon the mind of the doer(B), the mental perspective of the doer(C), outward behaviour of the doer which is again based on his level of understanding of the aforementioned components(D). The one who is witnessing the event, the observer, looks only at the outwardly behaviour that is seen at physical level. Also, if there is an attempt to understand that behaviour, it is again done based on the combination of the mindset of the observer at that moment(A), past experiences and understandings impressed upon the mind of the observer(B), the mental perspective of the observer(C), after which, the observer reacts in a specific manner based on his level of understanding of the aforementioned components(D). There comes the conflict. The components A, B, C of doer and observer are never the same. They are always different, because each of us have different experiences, different levels of understanding and different perspectives towards events in life. There is no benefit when the parent is adamantly threatening or yelling at the child for refusing to finish her meal. The negative reactions do more harm than good in the mental development of both parent and child. There may be momentary satisfaction when threatening just worked and the meal finished, but does no good in the long run of the relationship. Likewise, hurtful reactions in any of the scenarios mentioned at the beginning of this post do no good to both the child and parent. How can there be understanding and bliss in such conflicting situations? As already mentioned, bliss is within each of us and is being camouflaged by momentary sensory reactions. Generally, in any situation, the outcome D is seen but the components A, B, C of the doer are not analysed and understood. When D alone is looked at, we don't find bliss When we go beyond A, B, C, all that we are surrounded by, is bliss. A person is neither A, B or C. A, B, C, D are all passing clouds, not permanent and do not have a set form at all times. They are ever-changing. We cannot identify a person with his actions. We need to go much beyond the actions as well as the components A, B, C and understand that D is only the result of A, B, C which are ever changing and hence cannot be judged as right or wrong. Given exactly same situation at two different times, D at one moment is different from D at another moment because A, B, C are continuously evolving and D is based upon A, B, C.
What needs to be analysed when dealing with child's needs and attention is not just D but the entire combination of A, B, C from the perspective of the child(doer), not as a parent(observer). Only when you imagine yourself in your child's position who is throwing tantrums when being called for bath, can you understand what the child's mind is actually preoccupied with, why her mind cannot accept that it needs to attend to something else immediately, how her thinking is not completely developed and hence the inability to have control over her senses that leads to delay in moving her body out of the bed and finally, how you can respond to your child after analysing your child's A, B, C components. When parent starts thinking from the child's components of A, B, C, the parent's response D will be in accordance with the frequency that is set in child's mind and easily understandable by the child. Thus, there is peace in resolving conflicts and ultimately, even if delayed, getting the child do what is supposed to be done according to need of the hour. Always remember to think from your child's perspective, remember to respond in your child's frequency and you will experience bliss not only internally but also in the outward behaviour of individuals involved calling it a journey of blissful parenting. Lastly, remember that bliss lies not just in giggles and hugs, but also when dealing with conflicting mindsets. It boils down to how you handle it and what you are looking for in the long run of your relation. This post here also serves as a reminder on how we can improve our perspective in life. I was walking fast, carrying my one month old, towards the other room to get her play gym, when A quickly followed me saying she wants to get it, just when she also said she would get her toy and then get the play gym...me, instead of waiting for her like I every time do meticulously, didn't pay attention (in a hurry to do something) and went ahead to get the play gym. A walking back with her toy, not finding me where I was asked to wait by her, became furious and broke out in loud voice, throwing away her toy and hitting down the play gym from my hand. I understood the reason for her reaction. She expected I would wait for her until she got her toy while I could not pay heed to her in my hurry. I got her close to me, patted her and said, she could tell me if she wants something and I'm always there to listen to her. In total clarity, I could observe that she actually forgot why she was upset for and she was feeling bad for how she reacted by throwing down the play gym. She could not reason her action. Upon my repetitive asking, she said she didn't want her toy hence threw it. I asked if she wants the swing for her sister and she agreed. The whole point is, Kids just react. They do not know what actually happened and why they reacted that way. They do not have sensory control. They learn the art of controlling one's senses from their parents. If we, instead of teaching them, yell at them without realising the reason for their outburst, who else can they reach out to, for love and affection. Where else can they learn to stay calm amidst all the chaos. As parents, it is our responsibility to practice what is right and set an example for our children. Give your child the much needed resource - time. Whatever the child may be doing, give her time. However young/old the child is, give her time. Give her enough time to eat. Do not hurry your child. Give her ample time to fall asleep. Give her time while trying to solve something. Give her time while doing her home work. Do not rush your child in getting her to finish something. Couple of days back, I was faced with the situation where my new born was crying in my arms while the sleepy-but-not-willing-to-sleep toddler was moving about on my lap telling me about her day and all that she did in school. As a momentary requirement, I felt one of them should definitely fall asleep immediately for which my toddler had better probability. The next moment, it also struck to me that, in my rush to calm down things I could actually elevate the restless emotional frequency among all three of us. I could be losing out an opportunity to connect to my toddler while she was sharing her day with me. At any instant of time, our thought pattern need not be same as our child's. They may be trying to express something very important or very close to their heart while we are trying to rush them through life. It was not late when I realised what I could be harming in a moment of restlessness and very willingly, I heard out all that my toddler wanted to share, acknowledged her, replied with some kind words and soon, she fell asleep, happy and emotionally content. All that is needed in life is not only good grades, good position, good money but heartfelt emotions, a kind person who can listen to you. Remember when you become one such person of whom you dream your child should be, you have already laid a positive path for your child to follow. Similarly, do not rush the child during meal time, fresh time or play time. Consider every moment as an opportunity to learn about your child.